Hello all, Natalie here to talk about some plans. I feel I should begin with informing you all of one fact: I grew up on the images of Tolkien and Shel Silverstein and JK Rowling and Maurice Sendak (for those of you who perhaps don’t know stories by their authors, that’s Lord of the Rings and Where the Sidewalk Ends and Harry Potter and Where the Wild Things Are), and they have greatly influenced me both as a person, and as an artist.At the age of ten, I was still unequivocally convinced that dragons could be nothing but real, and that there were mermaids in the lake. The lake’s been drained now, so I suppose that solves the mermaid question, but I still can’t quite seem to let go of a sliver of hope in the existence of dragons. But other creatures interest me too, perhaps less wholesome creatures than dragons. The giant spiders present in both Lord of the Rings and Harry Potter, for example (for the record, Rowling got that from Tolkien), or the spliced mutants of popular urban lore which we commonly call cryptids. All of these creatures and more enchant me. And now I feel compelled to divulge another fact: I remember things primarily in color. If you were to ask me the day after visiting a place or watching a movie, what my greatest impression of it was, I would probably give you a color, or a list of them. of paints, acrylic and oils, and stacks of canvases and pads of paper. The days were hot and we worked long. I began a painting of something that, perhaps surprisingly to you given all I have just informed you of, I had never painted before: a dragon. It was an oil painting (oil is my preferred medium, I don’t know why I ever thought I’d use the acrylics I brought along), something that before then had only taken shape as vase or a lemon or perhaps a bottle, all very interesting things to paint, rather like a puzzle, but nothing so exciting and giddying as a dragon. I made some liberatingly sloppy oil-pastel creatures as well, mixed in with Basquiat-style swaths of color and expressive word vomit. When the dragon was done I put away my oils, and, for some inexplicable reason pulled out my watercolors, and instead of attempting realism, just let the colors run until I was satisfied, producing oddly satisfying amoeba-looking things. Then, I moved myself to the pond, and made my first floating islands. They were color palates of different colors I saw in the nature around me, in the style of the amoebas I had just invented. I made perhaps ten. One summer ago, I painted my first dragon a companion, in the same style as my original. The school year in between these two summers I had spent both creating delightfully creature-ized pots in clay class, and attempting a much realer depiction of dragons, slow process indeed. It was refreshing to return to the flow of simpler brushstrokes. 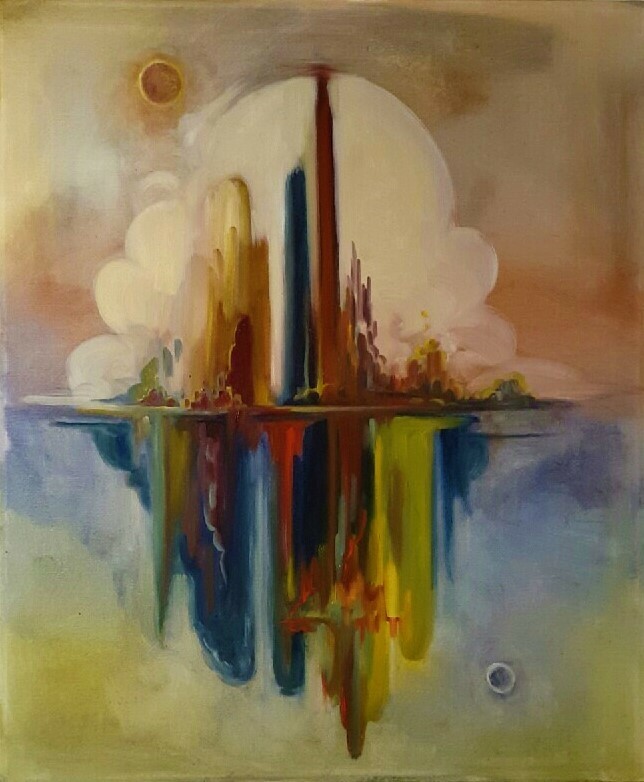 After, I decided to try my floating islands in oil. The first I painted on the day of the solar eclipse. It turned out wonderfully. 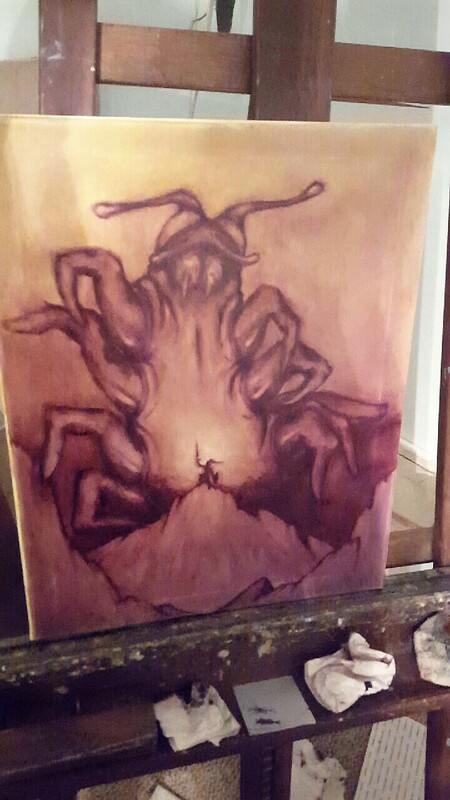 I then painted something else: my own sort of creature. Not a dragon or a giant spider, or anything that anyone else had ever done (so far as I know of), but something that I invented myself. Now we’ve made it to the plans part of all this. I know, finally, but the context is important for you all to understand. My plans are twofold and twofold: two methods, two endgoals. Method one: paint. Method two: clay. Endgoal one: gallery show. Endgoal two: college admission. I am going to continue with the creatures and the islands (or cities, if you’d like, many tell me that’s what they look like), and see where they evolve to. Occasionally, of course, I will pause to work on a still life or portrait I must touch up for applications, but my main focus here: the development of a body of work around a central theme which is substantial enough to fill our gallery. The theme, in question? Why, Floating Islands and Mutating Creatures, of course. I love your independent project! It is always a magical process to make a childhood dream become true in certain ways. I love how you used two tones of color in the painting of the floating island. Even if you forget your end goals, I think the process will still be challenging and enjoyable. I am looking forward to watching your gallery show as your dragon and giant spider-looking paintings are remarkably drawn. I hope you successfully achieve your two end goals. I totally can see the effect of your childhood on your development as an artist. I love seeing your work and the color combination is truly amazing. Hope you continue to find new ideas!